Cantilever Wing: Two-seater Side-by-side Cabin: 115 m.p.h. with 70 h.p. WITHIN the last few weeks the little Aeronca high-wing wire-braced monoplane has been a familiar sight at several of our aerodromes, the licence ДальшеMore>>> for the machine having been taken out in this country by Light Aircraft, Limited. The latest machine to be produced by the Aeronautical Corporation of America (hence "Aeronca") is distinctly modern in appearance and is a two-seater low-wing cantilever monoplane. The wing is built up in three sections - the centre section extends straight through the fuselage out to the ailerons - and has box spars and built-up spruce ribs with a double-drag trussing. The tip sections have solid spruce spars with ribs and bracing similar to those in other portions. Fabric covers the entire wing. The fuselage, which, likewise, is fabric covered, has a framework of welded chrome molybdenum steel tubing. A cabin, seating two, is built into the fuselage and permits fair visibility, due to the fact that the pilot sits on the front spar of the wing. Normally, the machine is fitted with dual controls, one set being removable. A Le Blond "70" engine (70 h.p.) is fitted as standard, but any of the radial engines in the 70 to 90 h.p. class may be specified. The engine mounting is of welded steel tubing. Within the wing is the main fuel tank, holding about 10 gallons. An engine-driven pump supplies the auxiliary six-gallon tank in the front end of the fuselage, which feeds the carburetter by gravity. A hand-operated fuel pump is also installed. Welded steel construction with fabric covering is used for the empennage. The tail plane is fixed, a small trimming tab being embodied on one side of the elevator. An oleo-type undercarriage with "semi" or "full" airwheels is attached to the wing stubs. Brakes are fitted as standard, and the entire gear is streamlined with metal fairings. Included in the standard equipment is wiring for navigation lights, an air-speed indicator and a compass. Powered with the Le Blond "70" engine the price is about 2,500 dollars. Length 22 ft. 6 in. Wing area 150 sq. ft. IT IS AN AERONCA: In this particular photograph the new Aeronca low wing monoplane is shown fitted with the Le Blond "70" engine, but the 85 h.p. Le Blond 90 h.p. Warner Scarab Junior, 125 h.p. Warner Scarab and 90 h.p. Lambert radials are alternative engines. 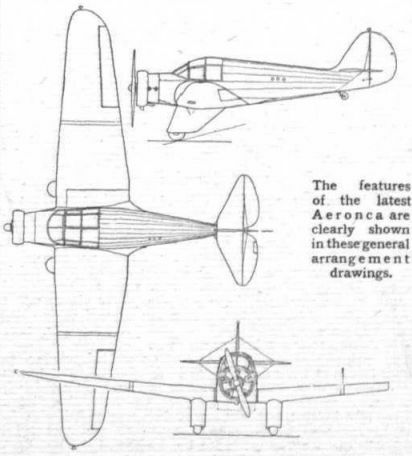 The features of the latest Aeronca are clearly shown in these general arrangement drawings.